Moss 1851 is about contemporary, paired back aesthetics, refined tailoring and style-led detailing. This Moss 1851 pocket square is made from 100% cotton and is a classic and stylish addition to your outfit. Pop into one of our on trend jackets and wear one of our Moss 1851 shirts opened necked. Alternatively, looks super smart in one of our tailored suits with a contrasting shirt and tie. Pocket square is fine, looks good. Shopping should be this. The service by Jordan was the best and really made my year. Retail experience on the high street the place to shop. Suit quality was great and a very helpful shop assistant made the experience very easy. Outstanding service. They go the extra mile. the final touch and attention to detail - Stefan even folded and pinned it for me! 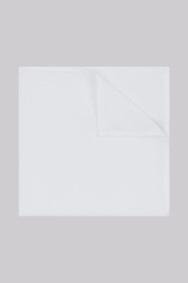 White cotton pocket square. Good but mallet than I expected. Not tried or used it yet! Great square in cotton and a simple white, as we know you can't possibly go wrong with a white pocket square when matching it to any colour shirt and tie. Bought 5 for wedding party, crisp white pocket square looks classy in navy suit. Would recommend. Discounted due to the issues above. Excellently fitting shirt straight off the rack. Lovely quality.